Give someone special the chance to learn how to surf. Choose from either the Adult Morning Surf Lesson, Child Morning Surf Lesson, or the Multi-Private Lesson at one of Perth's favourite beaches, Brighton Beach! As the best chance to learn all the basics, conquer the waves, and have a ton of a fun, it's an amazing experience for the entire family, for couples, or even solo adventurers! Enjoy one of the three 60-minute surfing lessons which include all equipment (surfboard, wetsuit and sunscreen). All you need to bring is a big smile and positive attitude! Kickstart your surfing skills with a private surf lesson on Brighton Beach, Perth. 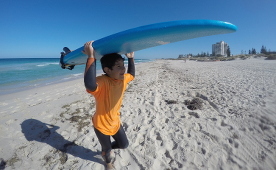 Kickstart your child's surf career with a 90-minute intro to surfing lesson in Perth. 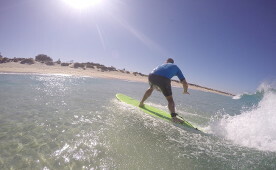 Kickstart your surfing skills with private surf lesson on Brighton Beach Scarborough in Perth.